Do you have a globe? 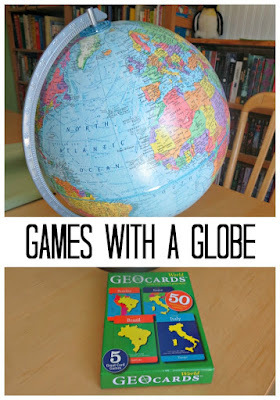 Challenge your kids to some geography games with a globe! We have done geography studies with Smarty since she was very little. We looked at maps during our studies, but we don’t have any free walls available to put up a map of the world (too many bookshelves). I wanted a globe for a long time, but the last straw was when I talked to Smarty about Italy and asked her casually where it would be on the map. She very confidently placed it in Asia and then relocated it to Africa when I said that Italy is not in Asia. So next time my husband was in Costco, he picked up an inexpensive globe. We specifically didn’t want an educational talking globe, since we think that some things are better learned truly hands-on, as evidenced by the fact that Smarty didn’t pick up country-continent mapping from many educational games she plays. 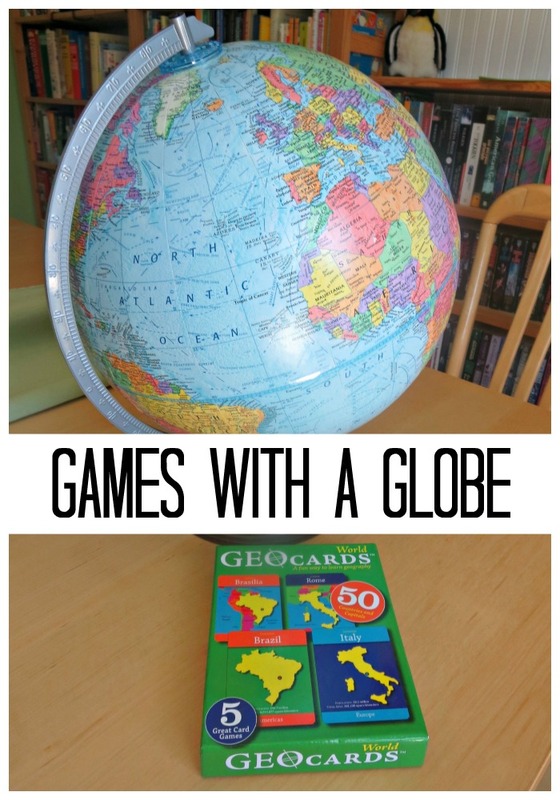 What Can You Do With a Globe? Obviously, it’s very convenient when conversations turn to specific world events or history events, and we can look up the countries on the globe. But it’s also great for games. Smarty loves A Minute to Win It type games, but I convinced her that it should take less than 30 sec for her and 15 sec for me to find a country on the globe knowing its continent. We took our Geocards and put them with a country name/continent facing up. Then we took turns finding the countries. The most difficult country for Smarty proved to be Ethiopia – she just couldn’t locate it in Africa until I gave her a hint to look for it close to Egypt. I was impressed that she was able to find Cuba where continent was given as Americas. She explained that she remembered the Cold War confrontation described in The Story of the World: Volume 4 and that Cuba was an island close to the United States. Play the same game matching capitals or landmarks. Spin the globe (or pull a country) and name its capital or give 3 facts about this country. Spin the globe and research a country where your finger lands. Do you have a globe or a wall map at home? We have an inflatable globe, and I love it. That has the added bonus of letting us throw it for games. But, it doesn't show as well how the earth spins and things like that. We have a whole collection of globes but with the kids we mainly look on the map. As mom and dad are originally from Europe but the family lives now in America, we started teaching the oldest, a preschooler, about some countries in Europe. Kids LOVE globes. There is just something about them. :) Thank you for sharing these ideas.